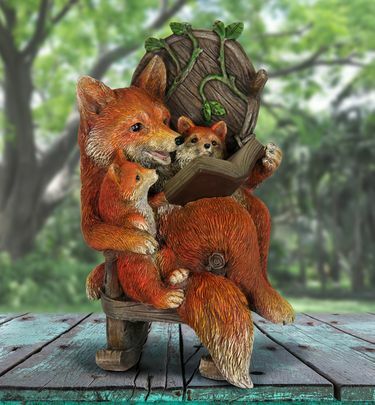 Rocking & reading with youngsters snuggled close, this nurturing fox statuary is an endearing addition to any garden. With solar powered LED lights, foxes will never put that book down, day or night! Made of durable resin for long term enjoyment and UV treated to help resist fading in the sun. Makes a great gift for the inspired reader, teacher, parent, grandparent and garden enthusiast! Size: 8.25" x 8.25" x 12.25" H.